foreign and Japanese scientific researchers in Tsukuba Science City and neighbors of the district through the year. 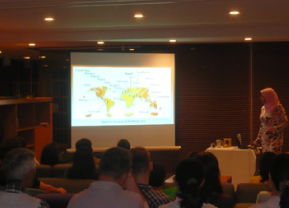 Evening Forum ranges a variety of themes such as history, traditional culture and customs of Japan and other countries of the residents at the JST Houses, and scientific researches of the residents. Conducted in English, followed by a short social hour. 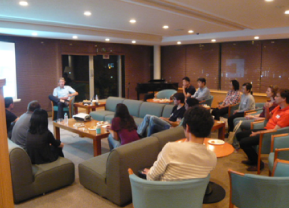 Held at the Communication Salon on the 9th floor at Nimomiya House. Candlelight Discussion is an informal event to engage scientists in interactive discussions about their field of research with participants in a suitable way for general audience. 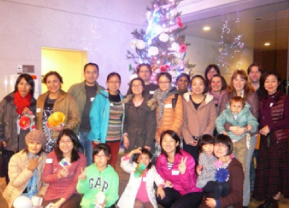 Conducted in English and held at the Communication Salon on the 9th floor of Ninomiya House. 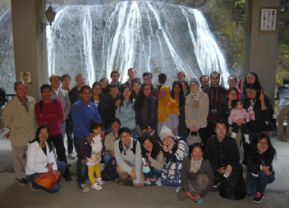 Japanese classes at two levels are available for residents at the JST Houses by licensed Japanese teachers. Held twice a week at Seminar Rooms on the 1st floor at Ninomiya House. 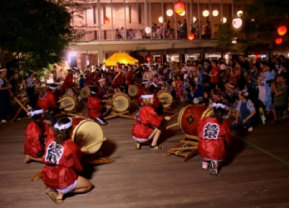 Summer Festival is the biggest event of the JST Houses held at the Court Yard and Assembly Hall at Ninomiya House in early August, expects about 700 people participating every year. It is an annual event of one day trip by a sightseeing bus, which is very popular among the residents every time as the seats are fully taken immediately after the annoucement is made. A few kinds of ornaments are made in the class, and those are hung from the tree placed in the lobby of the Ninomiya House and Takezono House to decorate them. 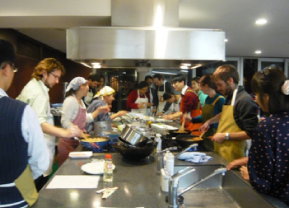 Cooking classes are held at Assembly Hall on the 1st floor of Ninomiya House. 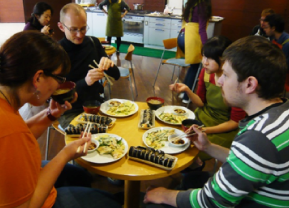 Some Japanese home cooking recipes are introduced in the class. Following the demonstration given by the instuctors, participants enjoy cooking and conversation over the meal. Some Japanese ingredients are also introduced to find them at supermarkets nearby. Some recipes of the various countries are shared by the residents at the JST Houses in the class. It is a good opppotunity to exchange information and culture each other over the meal. 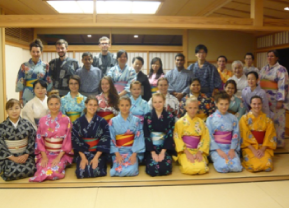 Various Japanese traditional culture and customs are introduced to the residents through the year. "Tanabata", the Star Festival is one of the traditional and seasonal festivals in Japan. 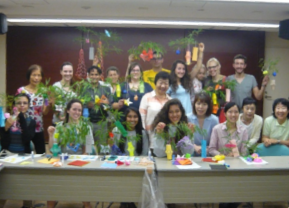 In the class, participants learn the origin of the festival and how to make several kinds of "tanabata" ornament using Japanese paper folding, "origami", and decorate them on bamboo leaves. Shodo is the Japanese art of calligraphy. 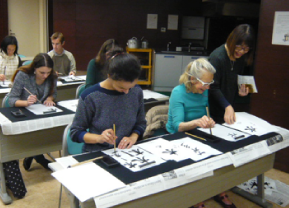 Participants learn how to use the ink brush, the meanings of some seasonal greetings in "kanji", and complete a few Japanese New Year's greeting cards, "Nenga-Jo" in a course of two classes. "Yukata" is a casual "kimono" made of cotton for summer wear, commonly worn at summer events such as local festivals and fireworks these days. In the class, participants learn how to get dressed in "yukata" all by yourself and fold it to put away. At the end of the class, some photos of ones in "yukata" are taken. This class is always popular among the residents at the JST Houses. 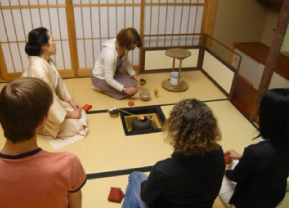 Participates learn the history of the Japanese tea ceremony and its ceremonial procedures, and enjoy the tea along with Japanese sweets in the Japanese room on the 9th floor of Ninomiya House. Zazen is a form of meditation unique to Zen Buddhism. This class attempts to focus on Zen as "philosophy" for the science minded, distinguish it from its religious aspects. 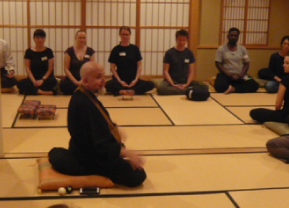 A short lecture and demonstration are given before participants experience Zazen.